Our latest research article has now appeared in the special issue of the MRS Bulletin, and can be downloaded from here. This article reviews some of the sequential and concurrent multiscale methods we developed over the past couple of years for dealing with water transport through high-aspect-ratio nanotubes embedded in membranes. Our results have demonstrated that (a) multiscale methods can actually be applied to far-reaching engineering problems (rather than just tested on simple canonical problems such as Couette flow), and (b) these methods finally offer a unique and economical computational solution that as a result are now being used to shed light on typically-conflicting experimental results for flows through aligned nanotube membranes. 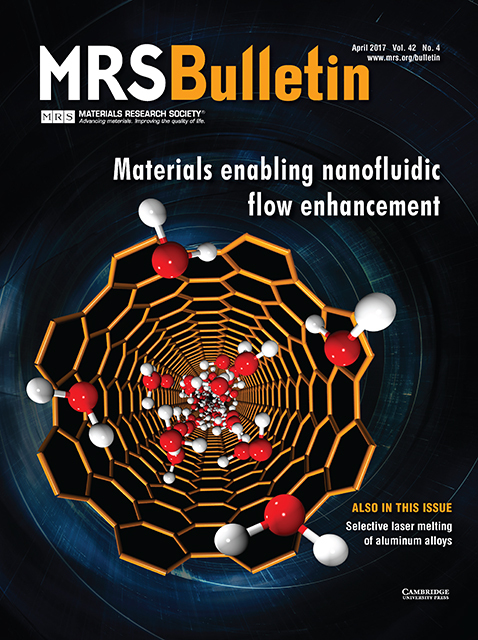 One of our lucky simulations – water transport through a 1 nm diameter carbon nanotube – has also made it to the front cover of the issue (see above).